While you can estimate measurements without a ruler, when it comes to making accurate, measured cuts for assembling multi-part miniatures made from wood or card, using the right tools correctly can save your miniature project from disaster. The key is to always measure the same way, so you know where to cut for accuracy. 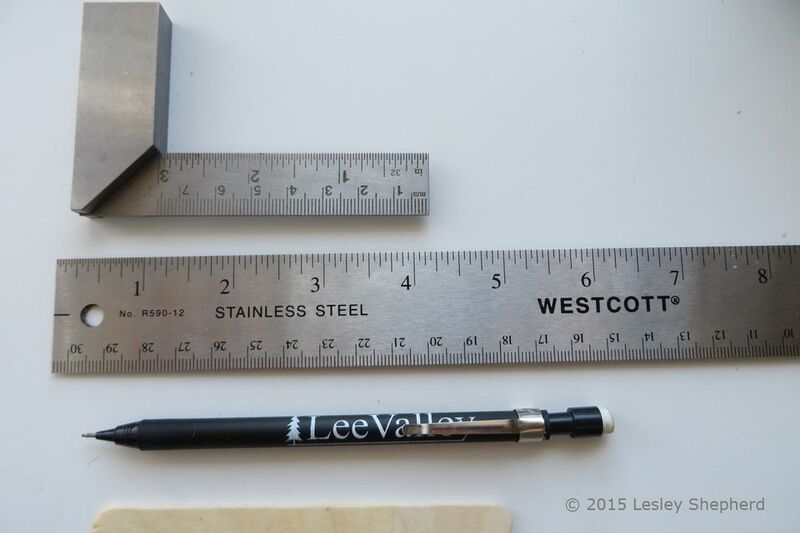 A stainless steel ruler- in your choice of measures allows you to clamp a clean metal cutting surface to your project. A square - the one shown here is an engineer's square, allows you to check the edge of a piece of card or wood for a square true edge, and also makes sure the marks you make as your cutting lines are square and true. A wide range of squares are available which are suitable for modelers, check the list linked here to see which type suits you best. There are also small specialty rulers available from model shops and drafting supply stores which will allow you to make pencil marks through small holes on the ruler, but these are generally not necessary for most miniature projects. The first step in making accurate cuts is to make accurate measurements. Start by making a small mark at the point where you want your cut to be. Your cut wood or card will be freed from the area between the cuts/marks, so make sure you measure exactly to the point you want and make a small pencil mark as shown in the top photo. Now use your square, to check that the edges of your wood or card are square and not off at an angle. Use the edge of the square to make the final cutting mark across the craft wood. If you are working with angled cuts you may want to use a simple miter box. Remember that the pencil mark is always removed from the measured piece when it is cut free. The razor saw or knife blade used to cut the wood or card will be set to cut along the inner face of the pencil line, leaving the pencil line on the scrap wood, not the measured section. The final step in the three-step process of marking, squaring, cutting, is to set your miniature up for a clean cut. In the photo on this page, a square is used as the cutting surface against which the knife is run. For larger projects, you may want to use bar clamps to hold a ruler down onto a work surface or cutting mat, clamped against your project. Make sure you use a sharp blade! Instructions for sharpening blades to keep them sharp can be found here at the end of the section on choosing and using craft knives. Take care when you make your cuts and pay attention to the grainlines of the wood you are working with. Use the correct knife for the purpose and apply even pressure as you cut. Small bits of attention payed to measuring and cutting will help improve your work and finish, whether you use card, styrene or wood as your choice. Baltic Birch Plywood or MDF for a Dollhouse?